Human society needs to increase food production by an estimated 70% by 2050 to feed an expected population size that is predicted to be over 9 billion people. Currently, infectious diseases reduce the potential yield by an average of 40% with many farmers in the developing world experiencing yield losses as high as 100%. The widespread distribution of smartphones among crop growers around the world with an expected 5 billion smartphones by 2020 offers the potential of turning the smartphone into a valuable tool for diverse communities growing food. One potential application is the development of mobile disease diagnostics through machine learning and crowdsourcing. The data at PlantVillage is the beginning of an on-going, crowdsourcing effort to enable computer vision approaches to help solve the problem of yield losses in crop plants due to infectious diseases. * Option to buy seeds, pesticides and fertilizers. 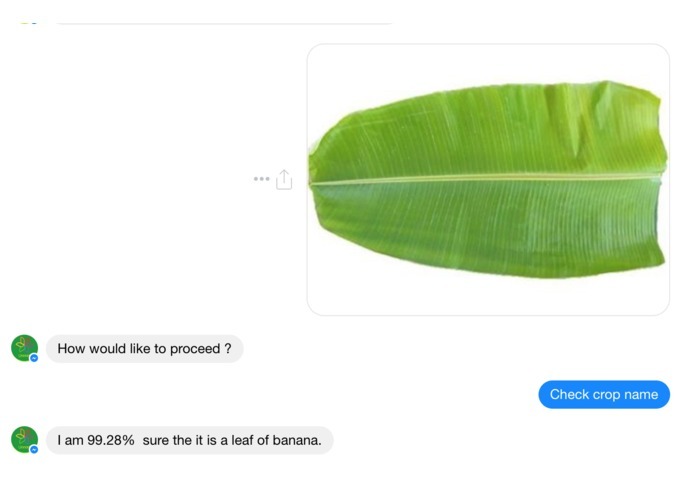 Our app lets you capture the image of a leaf, which maybe from a infected or a healthy plant. 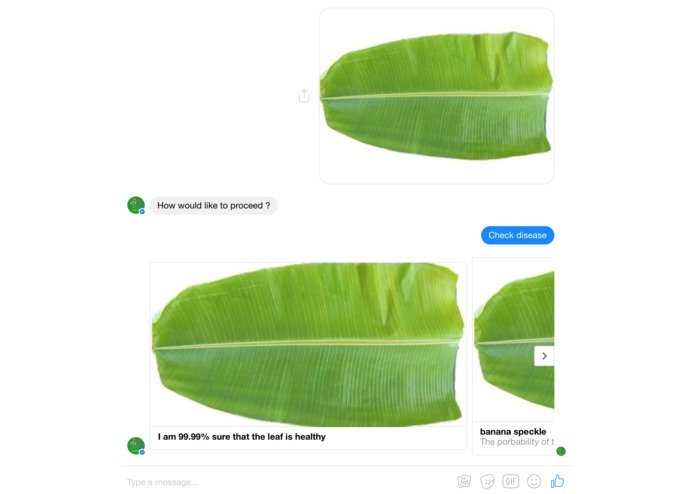 It first processes it with the microsoft cognitive api to determine whether it is a leaf or not. We don’t want unnecessary images cluttering on the server. It then, processes it against a deep convolutional network  to find out to which disease, its features resemble the most. We have a dataset of 50,000 + healthy + infected leaf images  and have a trained a Inception module on it. The image obtained as an input is then sent to a server where it is processed using the trained model and its probability of being a certain disease is found out. Though we have training data of lot of crops available,our App presently supports only apple and banana leaves.Training a network usually takes a lot of time ,and in future more functionality and robustness will be added. Accuracy of our results is a whooping 94.2%. 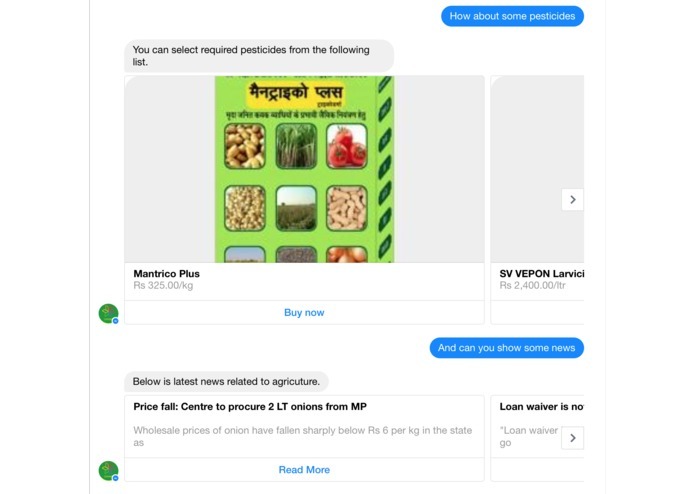 For providing the user with the latest prices of fertilizers, pesticides and seeds, we are scraping data from various websites and packing it into a single screen to provide easy functionality. We also provide shopping functionality. Simply click the item and the app redirects user to the product page. This feature will help farmers to know about the real market prices and eliminate the profit of middlemen. In order to keep the farmers updated with latest news and updates regarding agriculture and related new government policies and schemes, we are scraping data from various news sites and providing the farmer a single click feature to view all the important news. 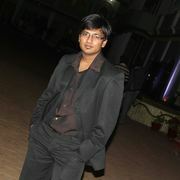 We do not want our users to loose focus of what they exactly want, hence we allow our users to interact with Unnati bot. 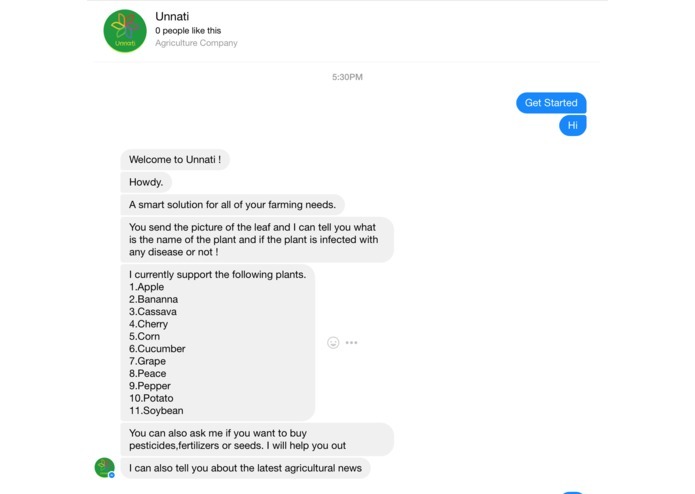 With our bot farmers can directly ask about the exact problem they are facing like a disease about the plant, where to buy seeds from, etc. This bot will also allow consumers to directly interact with the nearby farmers to buy goods at lower cost. 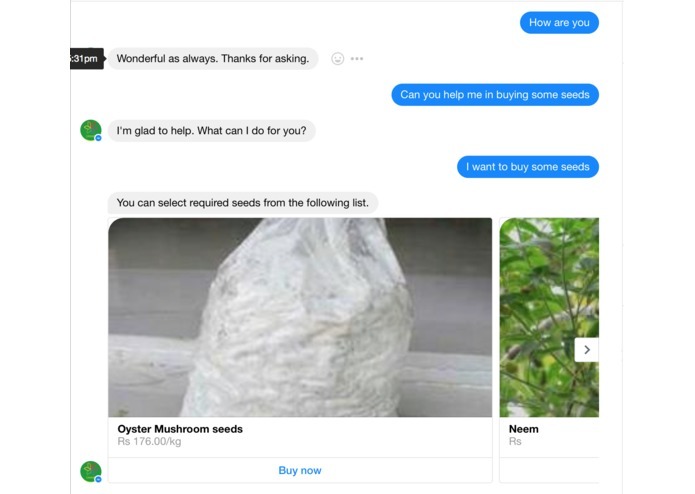 Allow the farmer to connect to the customers directly to sell their products just like an ecommerce sellers. Increase the datasets by community-sourcing images to detect diseases better. Add support for local languages of the farmers. Add support for voice recognition thus helping farmers to use the system on the go.